Dr. Elsie Joel-Morse loves being a dentist and her passion is evident from the moment you meet her. She has been practicing dentistry since graduating from University of Maryland Dental school in May of 2003. Understanding that skill and compassion go hand in hand, she combines her dental expertise with modern procedures and cutting-edge technology in order to provide you with the most current treatment options. Dr. Morse brings an ease to all dental visits and finds working with the apprehensive patient particularly rewarding. She also enjoys all aspects of dentistry and is a Preferred InvisAlign provider. 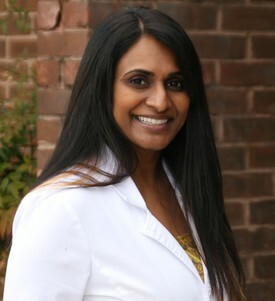 She has taken advanced training in CEREC technology and has been recognized as one of the Top Dentists by Baltimore magazine. Dr. Morse and her husband Bryan live in Ellicott City and enjoy spending time with their two daughters, Reina and Jasmine. During her free time, Dr. Morse likes to play tennis, cook, travel, and spend time with her girls that are “growing up too fast.” She is also a loyal Redskins fan and can be found watching as many NFL games as possible. You can contact Dr. Morse at drmorse@ejmdentalstudio.com.